Accepted theories of economic growth and growth takeoff cannot explain the rise of China. Wen will present an alternative theory, that China was able to take off because the government created markets for Chinese businesses. He argues that this theory provides a better explanation for the industrial revolution than the widely accepted institutional theory of economic development. Yi Wen is assistant vice president in the Research Division of the Federal Reserve Bank of St. Louis. A distinguished economist, he is the author of numerous journal articles and working papers, and most recently, The Making of an Economic Superpower: Unlocking China’s Secret of Rapid Industrialization (World Scientific, 2016), which challenges accepted explanations for the industrial revolution and for the marked increase in Chinese economic growth. 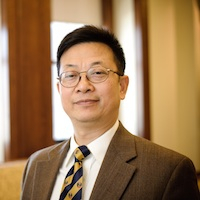 The coeditor of the China Economic Review, Wen holds an MA from the University of Notre Dame and a PhD from the University of Iowa.